- Our house is situated in a quiet rural setting – perfect for a relaxing weekend away, with plenty to do locally and further afield. - Historic Lawrence is only 15mins drive by car, or 70 mins by bike on the Clutha Gold Trail which runs past our front gate. - Fishing, swimming and picnicing along the Clutha River. - Swimming in the nearby Beaumont Community Swimming Pool at the old School (small charge for key to this facility). - Central Otago orchards and wineries less than one hours drive away. - Scenic coastal Catlins is only 1 hour 30 mins drive. - Dunediin is just 1 hour and 15 minutes drive. Lazy River Lodge is our holiday bach, built about 90 years ago as a railways house. Our bach has character, charm and some quirks. We’ve enjoyed many family holidays here over the years. We invite you to come and share our special family bach and unwind, enjoy the roses in the garden, listen to the bellbirds in the trees, take your afternoon tea (or a picnic dinner) down to the banks of the Clutha river at the back of our section - or if it's hot enough go for a dip! Explore the stunning river scenery upstream by bike or on foot - you'll find plenty of places for a picnic and a swim. Relax in front of the open fire in the lounge or stoke up the wood range in the kitchen. There is a TV but this will only play DVD's. Minimum night stay may apply over public holidays eg; Easter. Continental Breakfast Tray available on request $12 per person. Cleaning option available on request. Bathroom with shower over the bath, bathroom vanity and toilet. Two living areas - one is a separate lounge and the other is a living area attached to the larg kitchen. Small oven in the electric rangette. Plenty of cutlery, serving equipment, and dinnerware to serves at least 6 people. Large farm-style kitchen, fully-equipped with pots, pans, cutlery, dinnerware and a refrigerator. Cooking on a small rangette and electric frying pan. Small stereo to play CDs. An electric range of books to keep you occupied on a rainy day! Extensive lawn. Property has access to the Clutha River. We're thrilled that you had a great time. Thank you so much for choosing to stay at our lodge. Rustic old property in very beautiful grounds (lovely roses) and area. We had a great week at Beaumont. We had a great week at Beaumont. The cottage was perfect for what we were wanting. Central to lots of day trips. Lovely welcome with fresh flowers & some tips on fishing spots. A classic Kiwi bach experience in a house your great grandparents might have lived in. 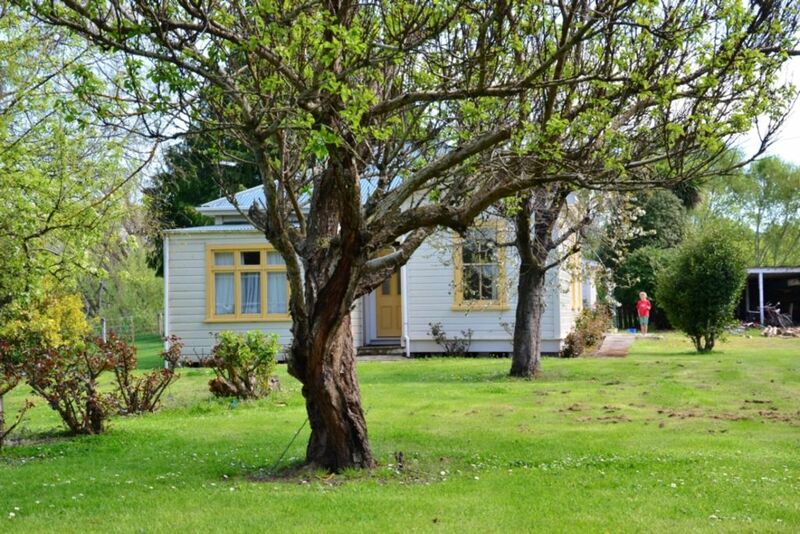 A classic Kiwi bach experience in a house your great grandparents might have lived in. Their furniture and wall coverings are still there. Beds and line are great and the property is kept very clean. There is a short walk to a tree enclosed river front and from the kitchen and back garden there is a great view of the Clutha. If you want simple and genuine and the Clutha this is a super place for a few nights. The pub nearby does decent food and a fine line in local colour. We really value our views of the Clutha from the kitchen and garden and feel so lucky to have our special place down at the river. Thanks for coming to stay! We're thrilled that you have a great time. Thanks so much for choosing our bach. A relaxing old style farm house (railway station house), comfy beds, nice linen, well equipped for family cooking. A few bugs for city boys ; ) Boys (13, 16) took a dip in the swimming hole. Peaceful spot right by the river. Easy location to go to Lawrence for icecreams, millenium track and through to Clyde to see friends. Thank you! Great to see that you had a great time at our special place. Thank you for coming to stay!